I am bumping this post to the top because I have included a picture of the goodies. Please be sure to post your card for this challenge to SCS using keyword CCB06 in order to be in the drawing., Anyone is welcome to play. Challenge is open until next wednesday. Hello and happy thursday! I hope you are having a wonderful day! Today is my turn to host a challenge for the Creatively Cute Blogger group I belong to. Anyone can play along, just post your card to SCS using CCB06 as your keyword. You have until Wednesday May 20th to post your card, I will choose a random winner. The winner will be announced on Thursday 5/21. The winner will receive a package of 36 sheets (4.5 x 6.5) designer paper by debbie mumm, package of square buttons, 3 clear studio g $1 stamp sets (fairy, mushrooms, sweet stuff), 3 ribbon flowers with pearl centers, self stick gems, 6 designer brads in antique silver (not pictured), and few prima flowers. The challenge I chose is " Something old and something new". 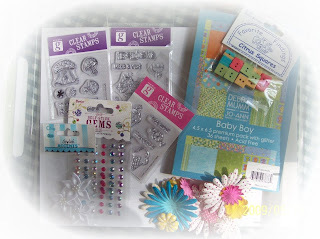 Make a card using one of your older stamps or stamp sets (maybe even your very first stamp) that have been collecting dust, in combination with some of your new favorites. Or, you can use one of your new favorite images in combination with some old designer paper that has been neglected, punches you haven't used in a while, etc. 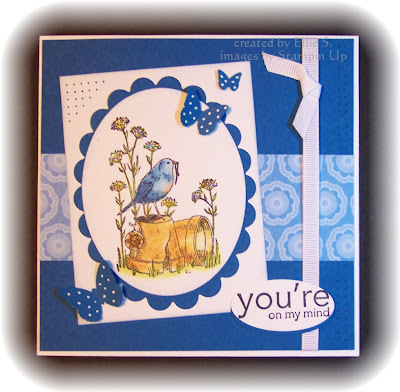 For my card I chose the retired set "Feathered Hope" by Stampin Up. It is one of the few SU sets I absolutely couldn't part with. The image was colored with prismacolor pencils and baby oil. I cut it out with my CM oval cutting system and matted it on a oval nesties shape. Designer Paper is from a pack of blossoms and butterflies DCWV designer paper. I thought butterflies would be a perfect accent to this card, so I used my newest punch, the MS butterflies punch. Card stocks used are GP white and Pacific point. The sentiment is from SU's set Upsy daisy. I used the large oval punch to punch it out. To finish this card off, I added the white grosgrain ribbon and did some paper piercing. I used a white gel pen (SU) to add dots to the butterflies. Thanks so much for visiting my blog today. I hope you will get a chance to play along. Oht is is lovely, sweet stamp set too! Very Pretty! I just love the colors..The image is real cute! Nicely done - I really like how you colored the image. SUch a Tweet Lil bird ,Ellie. Lovely card! Sooo cute & nice coloring! tfs!!! I also have this bird stamp set and haven't used it in quite a while. This is a pretty layout to show it off. What a wonderful card!! Love the fabulous layout and added butterflies!!! Cute card Ellie - love the little butterflies - I've ordered one and can't wait to get it! Just gorgeous Ellie! I'll have to dig through my stamps and play along with this one! Simply Beautiful! Love the blue and cute butterflies! Gorgeous card, love the colour and image. Thank you so much for visiting. As always I love reading your comments and creative criticism. This is a public blog, meaning any comments left on this blog will be visible by third parties and 3rd parties may be able to access your blog from the comment left here. No content from this blog will be republished by me, but I am not responsible for republished content by 3rd parties. Free shipping on US orders of $50 or more! Free Shipping on all US orders of $50 or More! Sunny Studios - Cute Stamps and Dies! Use Code SAVE5 to save $5 on your order of $49 or more! Please note: I do not design for any specific company and I do not receive a discount or free products from any company I use unless specifically noted as "sponsored post". All products are paid for by me at full retail cost and all opinions are my own. I may earn a small commission on some products if you purchase something through the links, this is at no additional cost to you. Click logo for direct link to challenge! Rubber stamps for all your artistic needs! All Kinds Of Themes for All Kinds of Occasions! Thrilled to have a card as a Best of 2018! I am not responsible for republished content from this blog on other blogs or websites without my permission. Please note: by joining and sharing in a linky party or challenge on this blog you grant the blog owner permission to post your first name, blog link and artwork you linked up here on this blog should you be the selected winner/top pick of a challenge. Do not enter any linky tools if you do not agree to these terms. This is a public blog, meaning any papercraft you link up or any comments left on this blog will be visible by third parties. The blog owner is not responsible for republished content from this blog on other blogs or websites without permission. This policy was last updated April 6th, 2018. My artwork is shared for your personal inspiration and enjoyment only and may not be copied for submissions to contests, magazines, etc. Thank you! I'm sorry but had to put this one on hold for now.